anyways, been working on kits still, but haven't been posting anything, Here's my latest work The Resin conversion of Perfect Grade 00 Gundam. 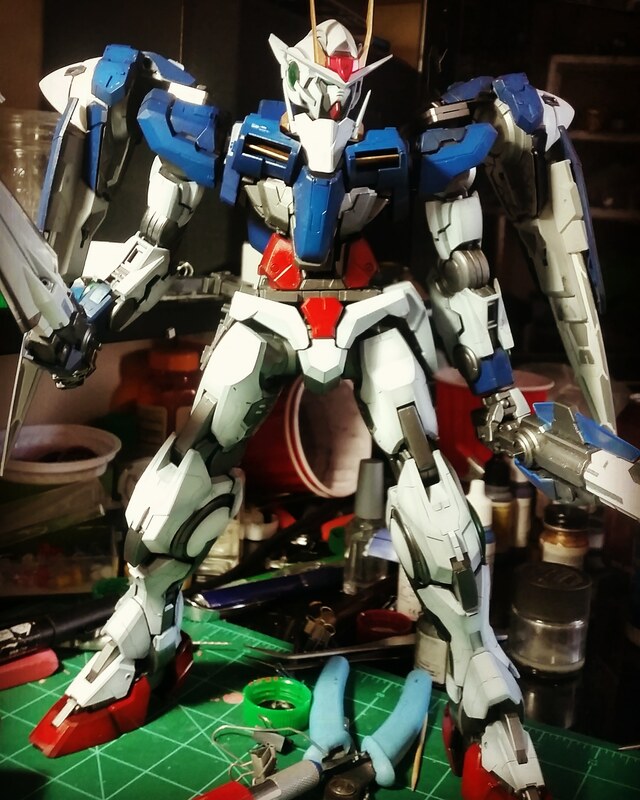 Missing a part, but mostly done, just need to work on the weapons and then 0 Raiser. I'll upload more pics later. Enjoy! Nice 00, I do like the Double o stuff. But anyways, here's some paint i've been doing. I plan on painting my Master Grade Crossbone's beam effects but wanted to test my skills first on a Hg first. Turned out ok imo, but i messed up a tad on the edges. Hopefully I can test a few more things and get it nailed down. It doesn't help that I've been using Vallejo model color and my brush keeps jamming, so i'll prob need to switch back to Tamiya or get some model air. Thanks for checking things out, Have happy New Year! 2 More kits added to the backlog! Really looking forward to the UCHC kit, as I've never done a dio before and I've been working on my figure painting in my down time. So finally decided how I wanted to tackle my MG Psycho Zaku. So I've modified the PZ to work with the parts the best I can. Nervously I started with the Mono Eye. Had to cut out under the Eye and clear away any obstructions. After that I wrapped the energy cables with jeweler wire and used heat shrink tubing to replace those god awful plastic sleeves. Base is set. I'm going to start planning the zaku head damage and get the sand laid down. Got my leo squad assembled minus the flight type that I'm waiting on. The chrome on the elbow caps and ankle joints (which you can't see because of the flairs) is actually Molotow Liquid chrome paint marker. I love this stuff. And this bazooka is huge and beautiful! Cool little guy!.. I feel you about the OOB build spree. I'm going through the same thing right now. Yea i can see that, but I guess when you're going up against FA you have to throw everything you have at it. Last edited by Mr. JQ; April 12, 2019 at 10:42 PM.